All members of a health care organization—front-line staff members, clinicians, and administrators—play a crucial role in offering an inclusive, affirming experience for all people, including those with non-binary gender identities. Everyone, no matter their gender identity or expression, appreciates friendly, courteous, and effective care. In addition, non-binary people, who have gender identities other than male or female, have unique needs when interacting with the health care system. Non-binary people face numerous health disparities as well as stigma, discrimination, and a lack of access to quality care. However, you do not need to specialize in non-binary health care to give your non-binary patients an affirming experience. 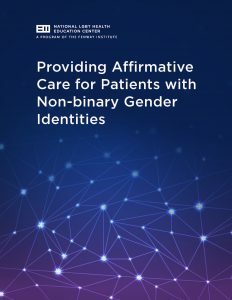 This document includes important terms and definitions, data, three case scenarios, and expert-informed practices, all of which offer suggestions for how any staff member within any health care organization can implement simple changes to improve the experiences of patients with non-binary gender identities.